FTR #783 Can You Put Lipstick on a Nazi? Introduction: This pro­gram con­tin­ues analy­sis of the instal­la­tion in the Ukraine of a gov­ern­ment com­posed largely of polit­i­cal forces evolved from, and man­i­fest­ing ide­o­log­i­cal con­ti­nu­ity with, the fas­cist OUN/B. Hav­ing staffed the 14th Waf­fen SS (Gali­cian) Divi­sion and the Ein­satz­grup­pen (mobile exe­cu­tion squads) in the Ukraine, the OUN/B was a piv­otal ele­ment in the post­war Gehlen spy out­fit in its CIA and BND incar­na­tions, the Anti-Bolshevik Bloc of Nations and the GOP eth­nic out­reach organization. OUN/B has been deeply involved with covert oper­a­tions and fig­ures in the inves­ti­ga­tion into the assas­si­na­tion of Pres­i­dent Kennedy, as well as the de-stabilization of the Soviet Union dur­ing the cli­mac­tic phase of the Cold War. With a pro­found pres­ence in the GOP’s eth­nic divi­sion, as well as the con­tem­po­rary Ukrain­ian polit­i­cal infra­struc­ture, the OUN/B is any­thing but an his­tor­i­cal relic. The devel­op­ment of the OUN/B in both the U.S. and the Ukraine is explained in great his­tor­i­cal depth in AFA #37 . The Orwellian aspects of the Ukrainian crisis could not be exaggerated and are explored at greater length in this program. An important new post by George Eliason raises a number of important points and, in so doing, deepens our understanding of the horror show unfolding in Ukraine. Of major significance in understanding the Ukraine situation is the support given to the outright Nazis and fasists of Swoboda by Western governments. (Swoboda dominates the “new” Ukrainian government.) An arti­cle in Germany’s ven­er­a­ble Der Spiegel  informs us that, in addi­tion to the rela­tion­ship between Germany’s top neo-Nazi party and Swo­boda, the lat­ter has inter­faced with, and received sup­port from, Germany’s ambas­sador to the Ukraine and NGO’s asso­ci­ated with Angela Merkel’s CDU. A fac­tor that is cen­tral to the Ukrain­ian sit­u­a­tion is that country’s nat­ural gas reserves. The Ukraine has a quar­ter of the world’s proven nat­ural gas reserves. The Russian absorption of the Crimea will significantly improve Russia’s ability to develop the offshore gas fields. Program Highlights Include: The pride in the OUN/B mileiu of the dominant Ukrainian participation in the Babi Yar massacre during World War II; review of the OUN/B milieu’s deliberate distortion of the Holocaust, making it seem as though their Nazi/SS collaborators were actually resistance figures; discussing the possibility of NATO arming of the Ukraine, Defense Secretary Hagel has been speaking with his counter part Ihor Tenyukh of Swoboda . 1. A very important article by George Eliason illustrates just how extreme the OUN/B heirs dominating Ukrainian politics really are. EU politicians that supported the Maidan Revolution are voicing concerns bordering on fear about how much control Ultra Nationalists have over the government in Kiev. Chancellor Merkel’s government is telling her she can no longer afford to ignore the Ultra Nationalists in Ukraine. They are scared Germany will be responsible for setting up a new Reich. It’s time to strip away the rest of the veneer and take a look at what’s really there. Forget about the Nazi symbolism, and ultra-nationalist exuberance. I will even grant supporters of the current government that much. Every important ministry, from education and social policy to policing, prosecution and national defense, is headed by Ultra Nationalists. In every aspect of national life, Ultra Nationalists now determine what it means to be Ukrainian and all the policies needed to enforce it. Even Prime Minister Arseniy Yatsenyuk falls among this moderate [?!–D.E.] majority. For generations his own family has had a proud tradition of service to the Ultra- Nationalist cause and has won awards for their service. Before Maidan it hurt his chances for election. After Maidan he didn’t need to worry about election. The Banderas, or Banderites, are activists in the Ukrainian Ultra Nationalist movement that is now in control of the government in Ukraine. Under the militant leadership of Stepan Bandera in World War II, the ultra-nationalists organized the Ukrainian Waffen SS Galician, Nichtengall, and Roland Divisions that collaborated with the Nazis and were responsible for the genocide of over 500,000 people. Following the war, however, Ukrainian Nazis were the only group to escape trial at Nuremburg for crimes against humanity. Moreover, neither the Banderas, the Ukrainian Waffen SS, nor any other Ukrainian collaborators have ever apologized for their participation in genocide. “…the Germans have long admitted to their crimes, and have apologized for them publicly …. [The] president of the Federal Republic of Germany, Roman Herzog, [said] in his speech in Warsaw on August 1, 1994 … ‘I bow before the fighters of the Warsaw Uprising, and before all the Polish war victims. I beg forgiveness for what the Germans did.’ Russian president Boris Yeltsin, when he kissed monsignor Zdzislaw Peszkowski on the hand, whispered the words ‘I apologize’ …. According to Szawlowski’s description of the methods the Banderites employed against the Poles at Volhynia, treachery was the most frequently used. The Banderites told the Poles they were one people and family with them and that it would be treason if they left. The Bandera groups even promised to protect them–in writing! What else separates the Banderas from every other genocidal perpetrator of the war is this: Even though the German SS had units dedicated to genocide, the Organization of Ukrainian Nationalists (OUN) approached this mission with a zeal and barbarity that Hitler’s own units could not muster. They routinely tortured people with saws and axes, and used the most painful methods they could devise as means to kill them. The Bandera would attack using “self defense groups” that were locally organized. These civilian Banderas were the main force used to attack and slaughter the Poles. If any of the massacre victims managed to survive, they were torched, robbed, and killed by follow-up groups of women and children. Szawlowski’s work on the genocide committed by Ukrainian nationalists during World War II is brought up to date by the recent observations of Ukrainian Wiktor Poliszczuk. “… he condemns the dangerous activities of the post-UPA [Ukrainian Insurgent Army] nationalists in present-day Ukraine, taking place not only in Lvov, but even in Kiev, ‘Galician Fundamentalism,’ and other such phenomena. Also criticized by him are the promoting of the totalitarian and genocidal doctrines of the Ukrainian Dmytro Dontsov, the erecting of monuments to the SS-men of the 14th Ukrainian SS Division “Galizien” (“Halychyna”), the OUN [Organization of Ukrainian Nationalists] and UPA leaders: Yevhen Konovalets, Andryi Melnyk, Stepan Bandera, Roman Shukhevych and others, and the glorifying of the murderers of Poles, Jews, Russians and Ukrainians as national heroes of the Ukraine, after whom streets and squares are named, awaking the spirit of the Dontsov and Bandera era, so much hated by people.” This was written only a few years ago. Every major scholarly work–a prime example is the papers of Pers Anders Rudling–show that the Banderas murdered 500,000 people without even the pretext of an apology. They have lied and tried to change history in an effort to make Stepan Bandera and the Waffen SS heroes of the Great War. Among other tactics, they have tried to petition the UN to reclassify Bandera and take his name off the UN’s list of leading Nazi collaborators and perpetrators of genocide. Legitimizing these men would irrevocably change the history of the Great War. Right Sector became famous at the beginning of the Euro Maidan protests and subsequent revolution. It serves as the umbrella group for the combined militant Ultra Nationalist groups that existed in Ukraine prior to the revolution and that insist on a pure Ultra Nationalist Ukrainian nation under the most rigid conformity to Stepan Bandera’s philosophy. Mr. Yarosh is the leader of Tryzub (Trident) which is the core Right Sector group. He has spent twenty years doing nothing else but preparing for the revolution that will sweep Ukraine’s government into extreme Ultra Nationalism. Despite his words to the Israeli ambassador, Dmitri Yarosh has been very clear from his first interviews that he is guided only by Bandera’s writings and the writings of the group’s founding leaders. He adheres to nothing else. Mr. Yarosh is adamant about the fact that Stepan Bandera was not an anti-Semite. Both the Anti-Defamation League (ADL) and the State of Israel accept at face value that, given Yarosh’s claim that Bandera was not an anti-Semite–a claim he himself believes–the Jewish community can now relax about any contemporary threat from Ukrainian nationalists. But can the State of Israel, or Abe Foxman, chairman of the ADL, or anyone else sticking his fingers into this pie explain away the deaths of over 200,000 Jews at Banderite hands? No! The ADL describes its main purpose as fighting anti-Semitism and all forms of bigotry, and defending democratic ideals. Counterpose to that the entire history of the Ukrainian Ultra Nationalist movement, including its history of today. When you do, can there be any assurances from its representatives that don’t ring hollow? The thinking today is true to pre-WW2 form: “This can’t happen again.” Part of what is clouding the issue is the very Jewish backgrounds of some in the Kiev government–including Yatsenyuk. A few of the Oligarchs-turned-governors even have Israeli citizenship. During WW2, Babi Yar was the single most horrific act of holocaust at the time. Even today, the Banderite response to Babi Yar is “I am proud of the fact that among 1,500 Polizei executioners in Babiy Yar there were 1,200 OUN men but only 300 Germans.” This quote is from a Rivne city official named Shkuratiuk, and appears in the book Organized Anti-Semitism in Contemporary Ukraine: Structure, Influence and Ideology by Pers Anders Rudling. The atrocities at Babi Yar, and the accompanying brutality, were left to SS Nachtigall and the polizei. Both were Banderite. The reason was simple. The brutal work of genocide at this level made even hardened German SS uncomfortable. This fact is even obscured in the Holocaust Encyclopedia at the United States Holocaust Museum. During the period September 29-30, 1941, the first massacre at Babi Yar killed over 30,000 Jews. Over the next few years the genocide piled up. Victims from the Roma (Gypsies) alone numbered almost 200,000. Banderite apologists have offered a range of rationalizations, from “Ukrainians suffered too” to the surreal “Bandera’s men stepped back and the Jews did it themselves.” No kidding. Babi Yar was racial suicide. What separates Germany from the Bandera Nationalists in Ukraine is that Germany has taken responsibility for the atrocities they committed. Until recent events, they could say believably, “Never Again.” Contrast this to Lviv, Ukraine, where surviving members of the WW2 Galician SS, willing participants in genocide, still parade on holidays, proudly displaying medals given them by the German Third Reich. Instead of apologies, the Ukrainian OUN/Banderites/UCCA offer apologetics and write handbooks on how to escape responsibility for grievous crimes against humanity. They paint themselves, quite literally, as both victims and heroes, not perpetrators. Ironically, one such handbook is entitled “Genocide- NEVER AGAIN- The Teacher and Student Workbook”, printed by the UCCA (Ukrainian Congressional Committee of America) on the 75th anniversary of the Ukrainian Genocide. The “NEVER AGAIN” in the title is of course the cry of people that managed to survive the genocide. Can it also be used by the people that committed it, unrepentantly? How can a group that unquestionably committed the most brutal torture and barbaric murder in WW2 morph into champions of social justice? They continually deny involvement and try to convince the world of the same thing they teach their own people. They were victims and heroes. At the same time, they glorify their SS heroes at will. The 1st Division link is their homage to the Galician SS. This response from a former Arizona UCCA state chapter president really needs to be considered in the light of history and present circumstances. That one statement says it all. The only question he leaves unanswered is, Who is a Ukrainian? Do they include all families that have lived there for hundreds of years and speak Russian? How about people that do not support Bandera? How Does Bandera Fit in 70 Years Later? On June 30, 1941 Stepan Bandera declared the formation of the Ukrainian State in Lviv. Stepan Bandera made his lieutenant Yaroslav Stetsko the Premier. After the war the Bandera groups formed their Government in Exile that was given quiet legitimacy by both the US and Canadian governments shortly after WW2. Part of this was due to their support during the cold war against the Soviet Union, and part due to the size of their lobbying effort. They pump a lot of money into Congress. That they were legitimized by the US Government is clear from all the released Nazi War Crimes Disclosure Act documents I have come across. It is very clear that the most important branches of the Diaspora government are in the US and Canada. Until 2003 the exiled leadership of the Bandera Government of Ukraine was only one step away from the person of Stepan Bandera himself. The supreme leadership of Bandera’s Ultra Nationalists worldwide changed hands twice after his assassination. Both supreme leaders had been his closest associates. The first was Yaroslav Stetsko, Bandera’s Premier in exile. He took over control of the Ultra Nationalist Government in Exile on the death of Stepan Bandera and held the position until his own death in 1986. Upon his death, his wife Slava Stetsko took over the leadership role and lived to bring the worldwide movement home to Ukraine. Most recognizable Ukrainian politicians, including Victor Yushhenko and Yulia Tymoshenko , are protégés of Slava Stetsko. This will explain why Mr. Yuschenko made Stepan Bandera a “Hero of Ukraine.” The EU sharply objected to this at the time, because of Bandera’s involvement in genocide, and Victor Yanukovych subsequently rescinded the award. That didn’t work out well for him. The 1st generation Bandera government, which pledged fidelity to Adolf Hitler and committed rampant and brutal genocide that it still denies, was alive and well until 2003. It ruled and raised funds from the Ukrainian Diaspora, which constitutes a third of the Ukrainian population worldwide, or 20 million people. Today, the Kiev government is only the 2nd generation of Bandera government. Looked at realistically, it still promotes the teachings, policies, and doctrines of Stepan Bandera less than 10 years removed from their institutional moorings. The Bandera leaders of today were cultivated to make sure they would not stray far. The present government in Kiev can also be counted to be true to its history. One of the changes happening now in Ukraine is forced Ukrainization. 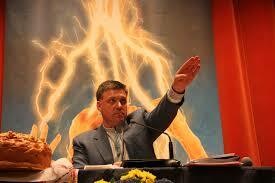 If you remember Nazi history and the Hitler Youth, you’ll understand what Ukrainization means. It demands the same unquestioning loyalty from little children, a loyalty even greater than that to family. What is forced Ukrainization at the pre school level ? Irina Farion was a favorite for the Minister of Education slot, until a discussion behind closed doors in the Senate. Sergei Kvit from Trizub (Yarosh core group), a real Ultra-Nationalist, got the nod instead. Here is Irina Farion speaking to a little child: “What is your name? Misha. It’s not Ukrainian. You are Mihailo! And your name? Masha. You are Marusa. But my mom calls me this! If you want to be Masha, go to Moscow! Imagine a government official speaking to children like this. Children are now taught that if they have Russian names they are second-class citizens. All of the children of Ukraine will grow up to be Ultra Nationalists. Those instilled with National Socialism will get a better education, a better job, a better life. What Does This Mean for South and East Ukraine? South and East Ukraine don’t want their children taught these things. Would you? Vladimir Putin and Russia are the only parties putting the brakes on that right now. The same Europe and America that 70 years ago violently overthrew the forces of bigotry and indoctrination are now saying that the Ukrainian people must accept them quietly! The only problem is all of these Oblasts (regions) are in Russia! No, I am not talking about the US and Russia. The spit propaganda that became western media portrays this as Cold War redux. Are you for the West? Good, you support democracy! Not so fast. The Russian invasion of Crimea took a turn for the weird yesterday. The Prime Minister of Crimea, Sergei Aksyonov, directed Crimea’s volunteer militia to arrest any person they see that looks like a Russian soldier! Crimean authorities have heard that Pravy Sektor is masquerading as Russian soldiers, trying to provoke conflict. The now official Ukrainian government organization tried to set off a bomb at a cafe in Crimea 2 days ago. This isn’t about East vs. West. The choice is simpler than that. It is about life and death. There are no compromises to make. If Kiev declares Stepan Bandera and all associated groups are illegal and genocidal war criminals, the southeast in Ukraine will relax. But, quite to the contrary, the first thing the Kiev government did was to make laws that legalized the teaching of Nazi propaganda. Without representation, they decided that 10 percent of people’s pay in the southeast would be taken without consent and given as support to the families of people that overthrew a constitutional government. Ukraine is not West vs. East. They want you to make the same decision with them. Are you for a world ruled by Ultra Nationalists? Ukraine says no. Are you for a government that supports the doctrines of the 3rd Reich? Will you support one? Are you supporting one? If the Ukrainian government that was propelled into power is not Ultra Nationalist, why are they making every move to show otherwise? Does the US government support Ultra Nationalist values? If not, why are they showing otherwise? 2. An arti­cle in Germany’s ven­er­a­ble Der Spiegel  informs us that, in addi­tion to the rela­tion­ship between Germany’s top neo-Nazi party and Swo­boda, the lat­ter has inter­faced with, and received sup­port from, Germany’s ambas­sador to the Ukraine and NGO’s asso­ci­ated with Angela Merkel’s CDU. When Hol­ger Apfel showed up at the Sax­ony state par­lia­ment with a “par­lia­men­tary del­e­ga­tion” from Ukraine last May, few had even heard of a party called Svo­boda. Apfel, who was head of the right-wing extrem­ist National Demo­c­ra­tic Party of Ger­many (NPD) at the time, proudly showed his guests — Ukrain­ian par­lia­men­tar­ian Mikhail Golovko and two munic­i­pal politi­cians from the Ukrain­ian city of Ternopol — around the par­lia­ment build­ing in Dresden. With a view to approach­ing elec­tions for the Euro­pean Par­lia­ment Apfel added that an “oppos­ing model to the EU dic­ta­tor­ship of Brus­sels Euro­crats” must be estab­lished and said that EU offi­cials were noth­ing but “will­ing helpers to inter­na­tional cap­i­tal.” Svo­boda, he exulted fol­low­ing the visit, is part of the “pha­lanx of patri­otic pow­ers” and encour­aged the “inten­si­fi­ca­tion of coop­er­a­tion.” Apfel’s Ukrain­ian guests agreed, say­ing that col­lab­o­ra­tion between the NPD and Svo­boda should be expanded. Given such ties, it is astound­ing that Ger­many has approached the Ukrain­ian right-wing extrem­ists in a man­ner that would be unthink­able with the NPD. On April 29, 2013, for exam­ple, Germany’s ambas­sador in Kiev met with Svoboda’s par­lia­men­tary floor leader Oleh Tyah­ny­bok. Dur­ing the meet­ing, Berlin has insisted, the ambas­sador exhorted Tyah­ny­bok to respect the invi­o­la­bil­ity of human dig­nity and human rights. But the Ukrain­ian right wing has also received instruc­tion financed by Ger­man tax­pay­ers. Party mem­bers appeared at events hosted by the Kon­rad Ade­nauer Stiftung, the Ger­man polit­i­cal foun­da­tion affil­i­ated with Chan­cel­lor Angela Merkel’s con­ser­v­a­tives. Exam­ples include the con­fer­ence enti­tled “Lessons from the 2012 Par­lia­men­tary Elec­tions,” the sem­i­nar series called “The Higher School of Pol­i­tics” and a dis­cus­sion on the 2012 elections. Even the Ger­man Soci­ety for Inter­na­tional Coop­er­a­tion (GIZ) has sup­ported the party. GIZ over­saw a project for the “for­ma­tion of admin­is­tra­tive capac­i­ties in the pub­lic financ­ing sec­tor.” Svo­boda par­lia­men­tar­i­ans took part in two trips to Berlin in 2013 in con­junc­tion with the project. One promi­nent party mem­ber even gave an inter­view in early May 2013 to the NPD pub­li­ca­tion Deutsche Stimme. In an inter­view con­ducted by senior NPD mem­ber Jens Pühse, Ternopol Mayor Sergei Nadal was asked why Svo­boda sup­ports the recog­ni­tion of descen­dants of for­mer mem­bers of the Ukrain­ian 14th Divi­sion of the Waf­fen SS as national heroes. “These Ukrain­ian heroes must be hon­ored irre­spec­tive of what has been writ­ten about them in the his­tory books of those peo­ples who were once our ene­mies,” Nadal answered. Germany’s Inte­rior Min­istry has also taken note of the Svoboda-NPD con­nec­tion. In response to a par­lia­men­tary query from the Left Party, the min­istry noted that the NPD had estab­lished a depart­ment tasked with main­tain­ing con­tact with right-wing extrem­ist orga­ni­za­tions in East­ern Europe. The Ger­man gov­ern­ment, the min­istry said, con­sid­ers Svo­boda to be a “right-wing pop­ulist and nation­al­ist party” which rep­re­sents “in part right-wing extrem­ist posi­tions.” The party, for exam­ple, orga­nized a rally to mark the 70th anniver­sary of the found­ing of the 14th Waf­fen SS Division. Svo­boda, mean­while, has estab­lished chap­ters in Frank­furt, Cologne and Munich. The Anti-Fascist Infor­ma­tion Cen­ter in Munich noted recently that in August of last year, some 40 par­tic­i­pants gath­ered in a Catholic parish hall to elect a Munich stu­dent of Ukrain­ian descent as their chairman. 3a. A fac­tor that is cen­tral to the Ukrain­ian sit­u­a­tion is that country’s nat­ural gas reserves. The Ukraine has a quar­ter of the world’s proven nat­ural gas reserves. Those reserves may well be seen as the answer  to the EU’s energy situation. We won­der if the Fischer-Tropsch  process might be used to derive motor fuel from that nat­ural gas, as is being done in the Mus­lim Broth­er­hood –affil­i­ated nation of Qatar . Once known as the “Bread­bas­ket of Rus­sia ”, Ukraine is now also Russia’s fuel tank. And, one Amer­i­can com­pany has 10 bil­lion rea­sons to hope noth­ing goes wrong. Ukraine sits on 39 tril­lion cubic feet of nat­ural gas reserves. That’s about one-quarter the world’s entire proven reserves. . . .
3b. The Russian absorption of Crimea is very significant for the Ukrainian natural gas situation. It will significantly facilitate Russian extraction of the natural gas from offshore fields. It also complicates things for U.S. and Western firms that had contracted with the old government in Ukraine for developing those natural gas fields. . . . . Russ­ian con­trol over the Crimean Penin­sula — beside the fact that it would solve the eth­nic prob­lem and the ques­tion of the fleet — would cre­ate a brand new sit­u­a­tion regard­ing the oil and gas mar­ket, because the stakes are high: if Crimea falls under Russ­ian author­ity, Rus­sia will be able to greatly expand its bor­ders in the Black Sea, among oth­ers, to the three enor­mous oil and gas field that can be found next to Crimea. Fur­ther­more, there is a tremen­dous amount of gas under the shal­low waters of the Sea of Azov, as there are fields with great poten­tial to the south­east and to the west of Crimea as well. Each one of the hydro­car­bon loca­tions can be found on the shal­low con­ti­nen­tal shelf, which has the advan­tage of the sig­nif­i­cantly cheaper extrac­tion of the oil and gas there, com­pared to the deeper parts of the Black Sea. Amer­i­can and Ital­ian com­pa­nies have con­ces­sions in these ter­ri­to­ries, but their terms were made with the Ukrain­ian state, and the cre­ation of a Russ­ian enclave sim­i­lar to Kalin­ingrad would cre­ate a rather sen­si­tive legal sit­u­a­tion. Addi­tion­ally, the Ukrain­ian lead­er­ship knows well the impor­tance of these ter­ri­to­ries, as beside the uncon­ven­tional ter­res­trial uti­liza­tion of nat­ural gas, the Black Sea loca­tions form one of the key­stones of their energy strat­egy. So Kiev will fight for the Crimean Penin­sula tooth and nail, not only because of its sov­er­eignty, but because of its hydro­car­bon trea­sures as well. . . .
4. As NATO weighs military assistance to Ukraine, Defense Secretary Hagel is joining the ranks of those interfacing with Swoboda officials. Ihor Tenyukh is the top Ukrainian defense official and a member of Swoboda. . . . . The Obama administration has not signaled what additional steps it is prepared to take, but noted that it would participate in a previously planned multinational military exercise in Ukraine this summer, called Rapid Trident. Mr. Hagel spoke by phone with his Ukrainian counterpart, Ihor Tenyukh [from Swoboda –D.E. ], on Wednesday. Carlos Pascual, the State Department’s special envoy for international energy affairs, left on Wednesday for a meeting in Kiev on how to lessen Ukraine’s energy dependence on Russia. . . .